Thanks to the continual tweaking since its 2012 introduction, the 2015 Honda Civic carries over largely unchanged, with the exception of a new Special Edition sedan. It slots between the base LX and more lavishly equipped EX, adding Honda's LaneWatch, automatic climate control, and other niceties. The 2015 is a reliable fun and fast car to drive for a cheap price. 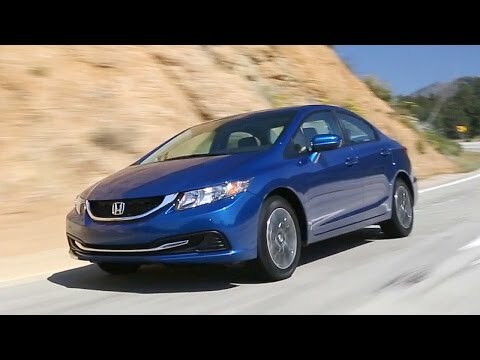 The 2015 Honda Civic is really fun and easy to drive and good for people who wants a sporty car. It drives good with nice suspension and sounds nice with a good 205hp it also has a nice racing look with the body and a diffuser to make it look more sporty. The 2015 Honda Civic is good for people who are looking for a nice looking car and fast for a cheap price it also has enough space for 5 people to sit comfortable and a good size trunk. The only issues I had with this car is at first the clutch and gas pedal seems too sensitive and it takes some time getting used to it but once you do it's fun and easy to drive. Also the seats are cloth so there really hard to clean and keep clean because some stains don't come off like leather seats or other material. The seats are really comfortable and nice though I love how they are red to make the car look more sporty and fast and they look perfect for this car. The dash is also nice it has carbon fiber accent but its not real it looks good though it's just not real carbon and some of the leather feels hard but looks nice at least. Overall it's a reliable and really nice looking car with good interior and fast to drive I guarantee you will have fun and love to drive it every time you get into it. Honda Civic is fun to drive, surprisingly spacious, and my first foreign car. This car is very comfortable. It is easy to drive and handles well, is very smooth, and has good acceleration. It has a sport gear which can be fun on the open road, although I prefer to save the gas, which includes using the economy feature. I love having trip information available to compare mileage and mpg over time and with different driving conditions. This car has only required maintenance work. I love the side view camera to make right turns and merges easier. I wish there was also a left view camera. It is easy to adjust information settings. Great screen for information purposes and easy to change display. The informational/sound touch screen is sensitive to easily change from one thing to another while driving, and some features can be changed on the steering wheel as well, giving multiple means to access information or make changes. Sometimes I have found the touch screen to be too sensitive, like when the phone power cord touches it, but I have only seen this affect the volume control. I would like some other features. The passenger seat has to be manually adjusted to move forward and back - I wish it was power operated like the driver's side. My car does not have a lumbar support option. I like knowing how many miles that I can go with the amount of gas left. I love my car. I have only had it for about three months. The only thing that I do not like at this time is the fabric of the interior. It is very hard to keep clean. And it is very hard to find a good cleaner that will take out any stains. I will be getting the seats professionally shampooed and will have to get the seats scotch guarded to see if that will help for the future. My car is black so it shows any scratches very clearly. When we bought our Toyota’s, we were given touch up paint pens for free. When I went to the Honda place to get one, I was charged $20 for one, very surprised! The seats sit kind of low in the car, but having a minivan before this car might make it seem lower than it really is. Other then these “problems”, I do like the car. The dash is very nicely set up, the radio is good, and the ride is very good. The gas mileage is awesome too! I love not having to put gas in it every time I turn around. Also, I like the dash feature that tells me how many miles I can go with the amount of gas I have in the gas tank. It is a big help when I am planning a road trip. Overall, I am very pleased with my first time owning a Honda. I would not hesitate to buy another vehicle from Honda.